Throughout the bulk of 2013, a few key speculation narratives about the growth of social media kept popping up on every tech news website: Instagram’s big boom, mobile’s rise in social, and Facebook’s (s fb) “teen problem.” According to GlobalWebIndex’s Social Report, released on Tuesday to the public by way of TechCrunch, most of those trends are accurate: Mobile and Instagram are both seeing major growth, but Facebook’s issues with teen adoption remain unsubstantiated. Social networks like Facebook and Twitter (s twtr) spent a lot of time (and continue to work on) optimizing their platforms for mobile, and it appears to be paying off. According to GWI, mobile access to social media sites actually overtook traditional PC access in Q4 of 2013, as 66 percent of users accessed their social networks by mobile compared to 64 percent by computer. However, microblogging sites — which include Twitter and Tumblr — are apparently best reserved for the tablet, dominating over both traditional computers and mobile for usage. No matter what the device, Facebook remains top dog across the board overall — account ownership, active usage and visit frequency, across all regions — although it has seen minor decline as other social networks gain mindshare. The key winner in this year’s new class of social networks is Instagram: A nearly 25% rise in active users betwen Q2 and Q4 of 2013 bring the estimated total of active users on the website to more than 90 million. It’s also popular for the kids, too, as teens represent the dominant demographic on the site, with a 39 percent share of active users. 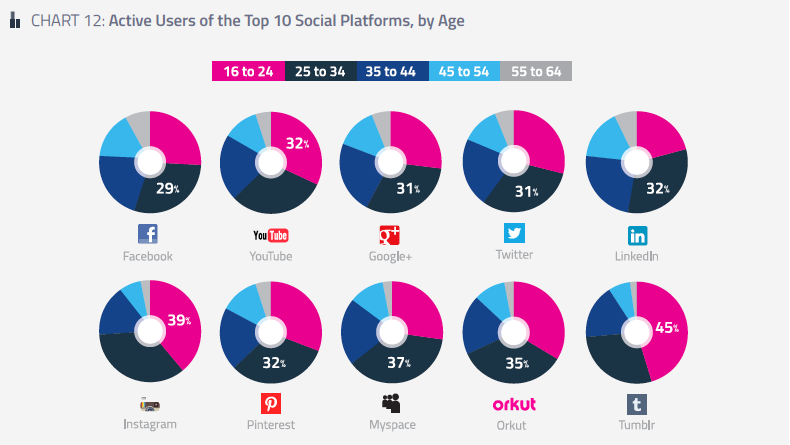 According to GWI, the only other social networks that can boast teens as their dominant users are Youtube and Tumblr. That said, Facebook isn’t bereft of teens the way that many media outlets have purported over the last year. Teens are increasingly frequenting newer and less popular websites, including but not limited to Instagram, Quora and Pinterest, and, as a result, more popular networks like Facebook, Twitter and Youtube have all seen slight declines in their teen demographic. But GWI’s data only indicates that Facebook’s teens shrank two percentage points, leaving a rough user estimate of 34.19 million — hardly the apocalyptic numbers released last week by iStrategyLabs. Overall, the main theme here is diversity. Users are accessing more social networks across more platforms than ever before, leading to a wider variety of social interactions happening daily. Perhaps the most telling piece of GWI’s data is that users, by and large, like to be social multitaskers — we are transitioning from commitment to just one platform to a diet of many different kinds of social media depending on our mood. The idea that wholesale abandonment will occur with no warning isn’t holding water as well as it used to, and our perspectives should adjust accordingly. Obviously relevant fact, I also feel joy by accessing the Facebook. No doubt that Instagram is a top exclusive and attractive site , but we are used to with Facebook. So it will be impossible to leave it. No one can say, yes my data is safe cause http://j.mp/Lbh6HX many banned ones are allowed now for access.